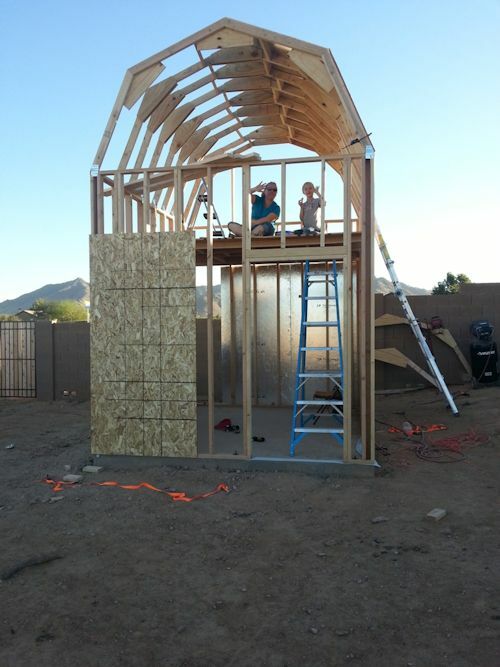 Glenn who lives in Arizona is building a playhouse for his kids using my 10x12 barn shed plans. Glenn has been kind enough to take some time out of his day to send me the following neat pictures of his building progress. Click on any picture to see a gallery of all the pictures on this page. 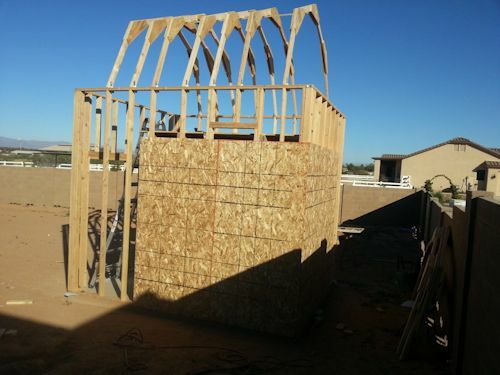 I have my 10' x 12' shed nearly complete, see the attached photos. We ended up going with 10' walls but still set the loft at 8'. Your plans were great in getting this project to this point. Now my wife and and I are debating how we want to finish the outside. We live in Arizona where everything has stucco, but my wife isn't too interested in going that way. 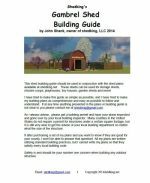 Do you have any suggestions on siding and suppliers I could order from? We aren't afraid to install it ourselves, just need a good source to order form. Thanks. 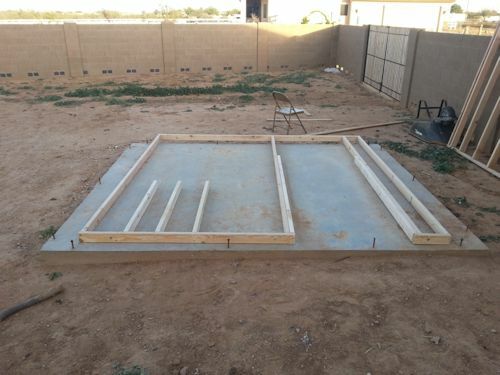 One of the easiest ways to frame and build shed walls is doing it right on the shed floor as Glenn is doing here. We went with the 10' walls because my wife wanted a lot of head room in the loft. With the loft at 8' I am able to stand up and not hit my head, so there is over 6' of head room in the loft. I plan on fully finishing the inside with insulation and drywall and some electrical. I have a small a/c unit that will be going into fight the Phoenix summer heat some. 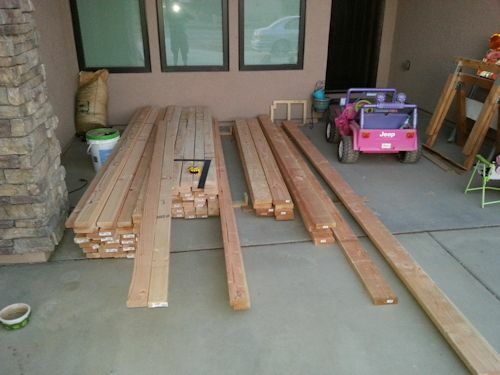 Initially the shed will be used as a playhouse for the kids and then when they outgrow it we think we will use it for storage, but we might end up turning it into a studio for my wife's artwork, or a woodworking shop or a HAM shack, not really sure. 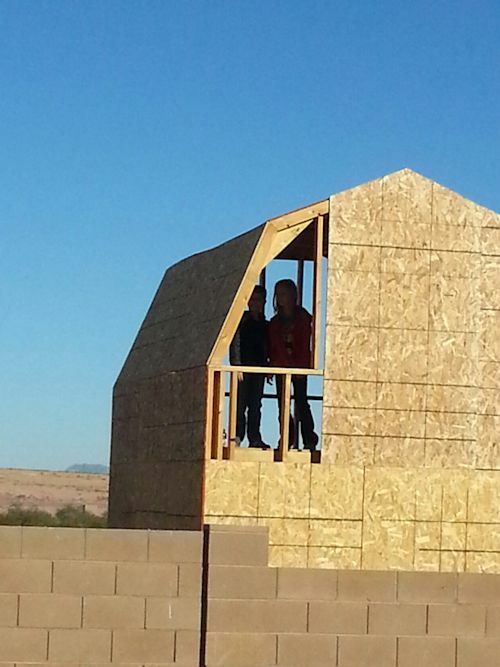 We figured we would build it in such a way that it could be whatever we ended up wanting. After we had it fully sheeted my wife made the comment that she wants to put some more of them for all sorts of things. I'll send some more pictures once we start finishing the outside. 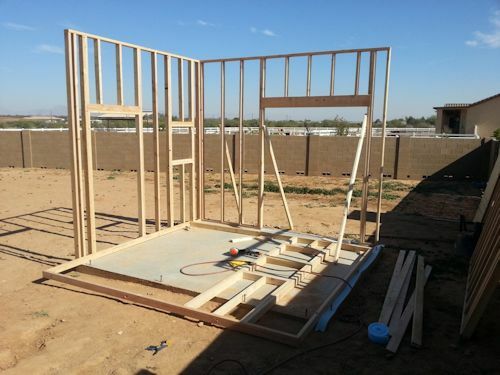 Wall Framing Looks Great Glenn! 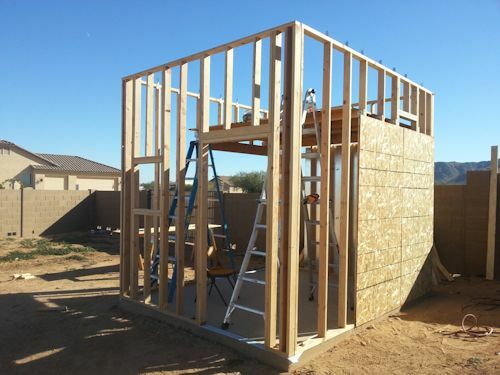 All four walls can be framed and built right on the shed floor just as Glenn is doing above. 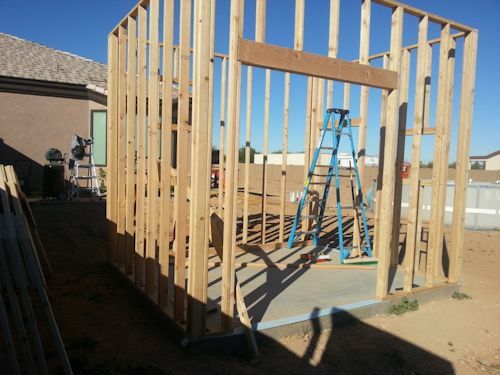 All Four Walls Framed and Up! Glenn it looks like you know what you're doing here. Great job. The blue paper you see on the slab in the door way is called 'sill paper'. This helps protect the walls bottom plates from moisture that can wick up from the slab floor. This is typically used on concrete floors and not wooden shed floors. This shed/playhouse Glenn is building for his kids is really unique and I don't believe any of my customers has used this modification before. 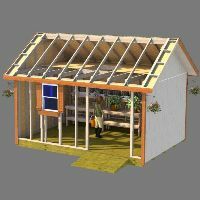 It is such an easy modification to do with the plans and the benefit it adds is really one of more storage space and head room in the loft area just by adding a couple of feet to the wall height. Glenn sent me these pictures the beginning of January and here in Xenia Ohio where I live the temps are in the single digits! Looks like Glenn's temps are quite a bit warmer there in Arizona. Rub it in Glenn! Looking at the wall sheeting, osb sheets only come in 8' lengths and that is why there is a gap in the sheeting up to the roof. This can be filled in with more osb sheeting and the Glenn will probably have a crew put on stucco to the walls to match his house. 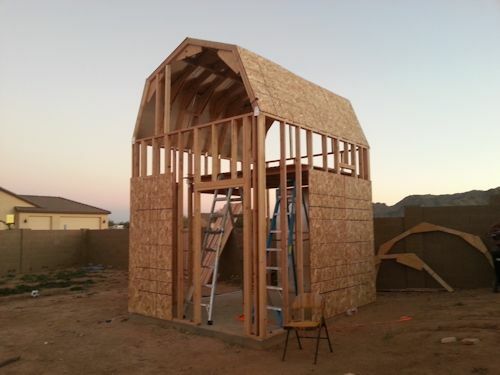 This is such a neat idea Glenn had for building a playhouse for his kids. 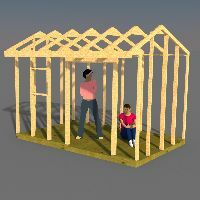 Then when they are grown up, Glenn and his wife can use the shed for storage and whatever any other needs for the shed might be. 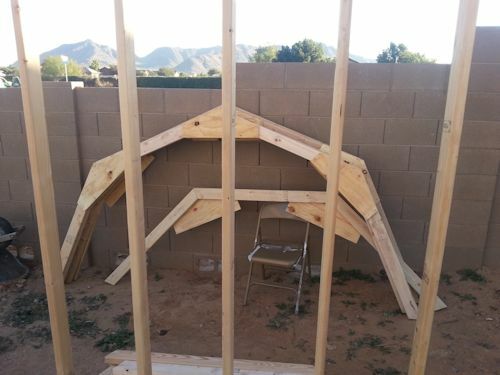 Glenn I can't wait until you send more pictures of your progress with your kids' playhouse shed. 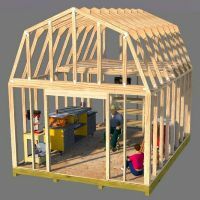 The barn shed plans Glenn used to build this playhouse shed are here.